Tharg asks me to do cover so I obey. There is no available strip art at present so I'm going to have to (shock horror) make it up. 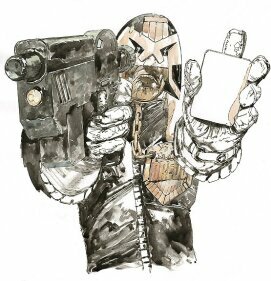 It's Dredd holding a card up to the reader, looking dramatic. My first effort was rejected as being not dramatic enough ("SNAP! 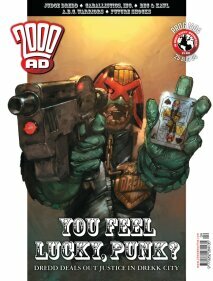 "), so we resort to the fall back position of Dredd holding a gun. Tharg settles on a close up cropped shot of Dredd pointing the gun in a confrontational way at the reader, and at the same time squeezing in the Card. This proves to be lot more difficult compositionally than I expected, as the pose tends to lend itself to a more horizontal aspect. Many versions of pose and positioning are generated, cutting out the elements and rearranging rather than laboriously redrawing. A final compromise (and it is that) is settled upon. 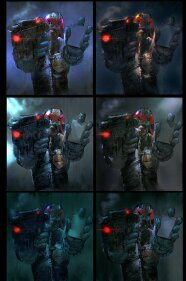 I then take photos of me wearing gloves in the pose with a suggestion of lighting brandishing a gun and playing card and pulling Dredd-like expressions. Thank Grud for digital cameras. Sadly no photos remain in existence. 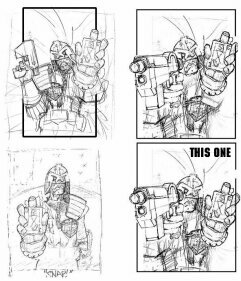 A composite photo of the best elements aids in the foreshortening problems that'll incuredred when drawing the finished piece. 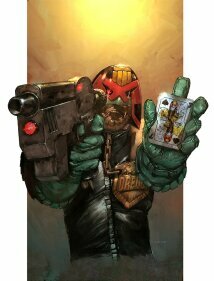 Tharg supplies me with a recent picture of the new Lawgiver which of course, is not entirely suitable. I make stuff up and hope no one notices. I work up the Cover on art board. How I work this stage varies from week to week it seems, but this week I am mostly using Rotring Pen and watercolour washes. The art for the playing card is worked up on a piece of scrap in keeping with playing card design. I suggest a "J" or "One eyed Jack" as opposed to the King, quite by chance mirroring the strip art. I tried to mimic the old "Judge Dredd" logo for the Jack of spades. The "J" that was in fact a silhouette of Dredd's face and helmet in profile but couldn't find any early progs. I much preferred the old type face. It was blocky and gritty and hard. The art is scanned into the computer and opened in PhotoShop as a multiply mode layer over a pre-textured background. Here a suggestion of lighting and colour may be presented to the editor for approval. In this case it was more for me. 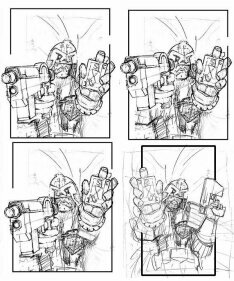 Dredd is a problem artistically in that his green gloves just leap off the page (which is what they're supposed to do!) But my personal preference is a more subdued and subtle palette for the more sophisticated comic buying audience...:) Just as there are many ways to hold a gun, there are many ways to light someone holding a gun. A useful aid at this point are contact sheets or a page of DVD film frame grabs printed out and used as colour reference. I use these colour references increasing as a shorthand to getting a look I want. As there was no background to this image, I just assumed gambling den, low tungsten lit scene, orangey yellow downlight with a bit of a cooler fill. A low resolution version is worked on in Painter, quickly blocking areas of tone and colour, before "upresing" and adding more detail. The multiply layer from the original document replaces the upresed version for tighter line art and merged with the background and refined further, bouncing the art back into PhotoShop for little tweaks such as Colour Dodge and Levels to add flare blow out and lighten mid-tones. A further option is presented to Tharg of the art framed or not, Tharg preferring the framed version with the art "exploding" out of it's boundaries. Tharg likes it and I'm granted a 30 minute lube break.